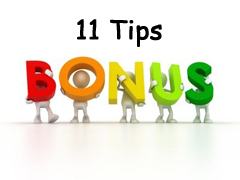 So, I am herewith 11 Tips to spend your annual bonus. Best time to review your financial plan is bonus time. Since you got something extra which can fill up gaps of your financial plan. Revisit your portfolio and see if you could find some shortfall against your goals. Bonus can be used to fill this shortfall. Another Best way to utilize extra money is by doing repayment of your loan. You can prepay home loan, personal loan, education loan etc. Remember prepayment of principal at earlier stage will give you higher benefit. Improving your home facility by using bonus money is good idea. Your home is probably single largest investment and you can enhance value of your home by spending money on maintenance or upgrades. This will make your home a better place to live. Don’t blow off entire bonus on party. You can use portion of extra money (approximate 10%) to party with your family. You can also plan to have holiday which you can’t afford on normal course. Bonus could be very good way to fill gaps of your emergency fund. It is advisable to keep 6-10 month of your monthly expense as emergency fund. If you have not build emergency fund yet it is time to look in to. Running last minute to invest for tax saving need is not good idea. This time plan your tax saving need in advance utilize some portion of bonus money to fulfill your tax saving need. Insurance is vital need today. If you are not insured or under-insured try to utilize bonus fund to fulfill your insurance need. Purchase good term plan. For your benefit Comparison of 27 Term plan is given here. It is always better to keep some extra source of income. If you don’t have any extra source of income you can think of building extra source of income. You can read more about passive income here. If you are living in rented house it is time to utilize bonus amount to lay foundation for property ownership. You can use bonus amount for down payment for your property. Remember you can get home loan up to 85% & rest all you have to finance on your own. It is good idea to spend 10% of your bonus on enhancing your skill. This could be either adopting some course or learning CD or books. Remember skill enhancement can help not only on your current role but also make you future ready for next job role. Last tip to spend your annual bonus is to share your bonus with needy people. Yes I am taking about doing some charity for the cause that is nearby your heart. Give charity and enjoy power of giving! Do share your idea to spend your annual bonus! If you like this post don’t forget to share it with your friends! « You want 100$ today or 200$ after month?